In the words of James Watson, codiscoverer of the structure of deoxyribonucleic acid (DNA), Barbara McClintock was one of the most important geneticists of the twentieth century. McClintock made major discoveries about chromosome structure and showed for the first time that movable elements within the chromosome (transposons) could control gene expression . In 1931, with her graduate student, Harriet Creighton, she showed that meiotic crossing over in corn separated formerly linked observable traits, thus proving that genes were located on chromosomes. McClintock went on to study the genetic control of coloration in Indian corn. She discovered a genetic element whose presence would cause the chromosome to break where it occurred. McClintock termed this element Ds , for "dissociation." The breakage caused by Ds interrupted the normal expression of nearby genes, causing the color variegation. McClintock also discovered that after breakage, the chromosomal fragment containing Ds can reinsert itself elsewhere, interrupting other genes and causing different effects. She coined the term "transposition" to describe this new type of genetic mutation. McClintock's discovery of the breakage and transposition of a genetic element conflicted with the then prevalent view of chromosomes as static blueprints, and her work was largely ignored throughout the 1950s. Her discoveries, however, laid the foundation for the dynamic view of the genome , and she was finally honored with the Nobel Prize in physiology or medicine in 1983. Keller, Evelyn Fox. 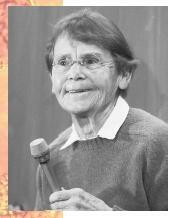 A Feeling for the Organism: The Life and Work of Barbara McClintock. San Francisco, CA: W. H. Freeman and Company, 1983. This website is really cool and is helping me with my science project that i have to do on Barbara McClintock! THANKS SOOOO MUCH!